I never had time to grieve properly. They were grieving the death of their father. He’s still grieving for his wife. Millions of people are grieving over his death. People in the street wept with joy when peace was announced. He wept tears of rage/joy when he heard the news. She wept buckets (= cried a lot) when Paul left. She began to weep tears of joy. He almost felt like weeping with frustration. She needed to weep for the loss of her husband. Phil looked on in disbelief as Maggie got up on the table and started to dance. Crowds lined the streets to watch the parade. Thousands of people lined the streets to watch the presidential procession pass by. Police lined the route of the demonstration. 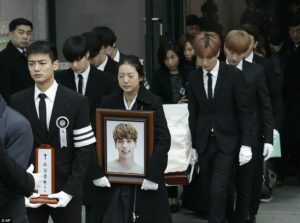 Six of K-pop’s biggest stars carried the coffin of fellow singer Kim Jong-Hyun, who took his own life this week, as weeping fans lined the street. 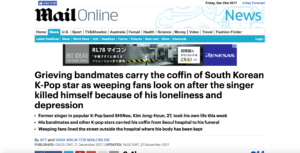 Kim, former lead singer of K-Pop band SHINee, was found unconscious in an flat in the upscale Gangnam district in Seoul earlier this week, and later died in hospital. The 27-year-old left behind a suicide note where he spoke of being ‘engulfed’ and ‘broken inside’ from depression. The old hotel has gone upscale in recent years. He had to leave his family behind in Chile. We left in a hurry and I must have left my keys behind. He was forced to leave the country, leaving behind his wife and children. She spoke of her sadness over her father’s death. People spoke of their fear as the flood waters rose. 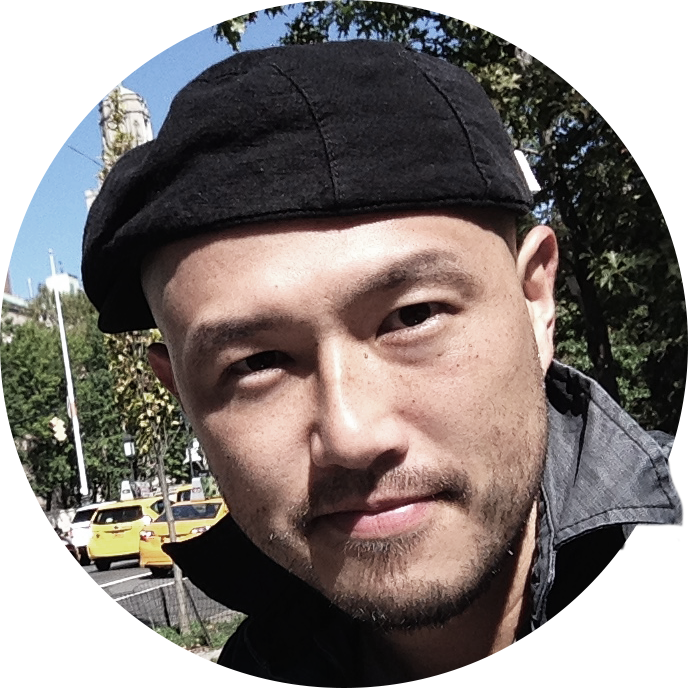 Kim’s body was taken to his funeral from the Asan Medical Centre in Seoul where it had been lying at rest. 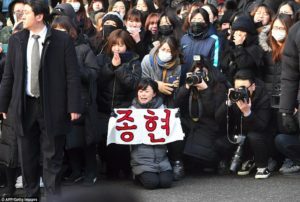 The procession was led by one of Kim’s bandmates from SHINee, bearing a plaque topped by a crucifix and reading ‘Kim Jong-Hyun, believer’, followed by his sister carrying a picture of Kim. 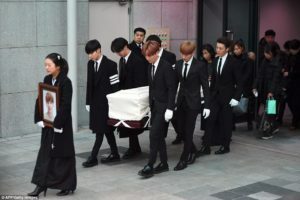 The coffin was carried by the three other SHINee members and three from Super Junior, another boyband managed by the same agency, SM Entertainment, which dominates the industry. 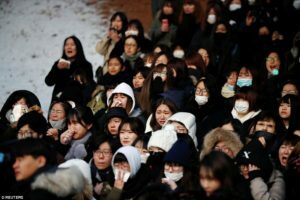 Dozens of prominent K-pop stars were present, including Girls’ Generation, EXO and Red Velvet, bowing their heads and praying, while people at the back sang Christian hymns. Fans, who have been coming in droves to the Asan Medical Centre for the past few days lined the streets outside. Your father was a very troubled man, but he’s at rest now. The festival will open with a procession led by the mayor. The anniversary was marked in 1689 with a huge procession through London. About 10,000 women, carrying pots of milk on their heads, walked in procession from one temple to another. The stone plaque bearing his name was smashed to pieces. Thank you for your advice – I’ll bear it in mind (= I will remember and consider it). There was a brass plaque outside the door listing the various dentists’ names. The First Lady unveiled a commemorative plaque. Mostly made up of teenage girls, the crowds were seen crying as the coffin was carried out and taken away. The funeral itself was a a private ceremony at an undisclosed location. But Kim, 27, was found unconscious in a hotel room in Seoul on Monday and was later pronounced dead at hospital. Kim’s close friend, musician Nine9, released his suicide note on her Instagram account, saying he had asked her to publish the message in the event of his death. Kim’s suicide note was published on Instagram by his close friend, musician Nain9, who said that she had been asked to publish the message in the event of his death. ‘I am broken from inside. The depression that gnawed on me slowly has finally engulfed me entirely,’ it said, adding he ‘couldn’t defeat it anymore’. 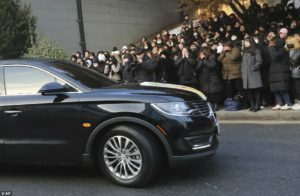 Seoul police said it seemed ‘certain’ that Kim’s death was a suicide, adding they planned to close the case without an autopsy as requested by his family. The meeting is taking place at an undisclosed location. The Rembrandt painting was sold at auction for an undisclosed amount. The company was sold for an undisclosed sum. Babies like to gnaw hard objects when they’re teething. A dog lay under the table, gnawing on a bone. David gnawed his lip, obviously worried. A rat had gnawed through the cable. Bilbao defeated Salamanca by 2–1. They defeated the Italian team and reached the final. Bill Clinton defeated George Bush for the presidency in 1992. The test completely defeated me. ‘Don’t leave me!’ she implored. She implored him not to leave her. Police said they were awaiting the results of an autopsy. Kim was part of the five-member K-Pop boyband SHINee that had become one of the country’s most popular in recent years. They released their debut album, The Shinee World, in 2008, and went on to release another four – with some of them reaching Number 1 on the US Billboard World Albums chart. The group has won a number of awards for their spectacular dance routines and a Japanese-language version of one of their hits, Replay, sold more than 100,000 copies in that country. Kim was seen as a model K-pop celebrity, who boasted flawless singing and dancing skills and rarely made headlines with the romantic relationships, drink-driving or drug use that derailed the careers of many other artists. He released his first solo album in 2015, topping the Billboard World Albums chart, and performed at solo concerts in Seoul only last week. K-pop stars undergo cut-throat competition and gruelling years-long training at the hands of their agents, who dictate everything from music style to diet and even mobile phone use. Many are also pressed to maintain a squeaky-clean and wholesome image at all times. She took her complaint to the local health authority. The rules are set by the passenger transport authority. She admitted her company’s responsibility for the disaster and went on to explain how compensation would be paid to the victims. The meeting went on a lot longer than I expected. We can’t go on like this any more. Things have got to change. She can’t go on pretending that everything is fine when it clearly isn’t. He didn’t talk about his exam results in case people thought he was boasting. Parents enjoy boasting about their children’s achievements. He’s always boasting of his great sporting achievements. She has a voucher for a free swim. Disagreements between the two parties have derailed peace talks. Renewed fighting threatens to derail the peace talks. The book is now topping bestseller lists all over the world. The song topped the charts (= sold the largest number of recordings) for five weeks. Scrapping of price fixing legislation led to a cut-throat battle for supermarket customers. Many firms have fallen victim to cut-throat competition. He eventually won the match after five gruelling sets. I’m a little pressed for time – could we meet later? She said she could teach the French class if we were really pressed. There is no possibility of salary increases, especially when the company is pressed for cash. He has lost his squeaky clean image. Journalists have been trying to discover if the senator really is as squeaky-clean as he claims to be. This movie is wholesome family entertainment. The party are hoping her wholesome image will appeal to voters. He looks like a nice, wholesome young man.